I lke the color...and it reminds me of one I used to have only in red with big red buttons!!! Man, Shelbie, that you can do that is admirable!!!! such patience and brains! Shelbie, your cardigan is wonderful! What yarn did you use? What an accomplished knitter you are Shelbie; I love the shawl collar. Looks great - love the colour! CUTE sweater! It isn't fall yet, maybe it will be just right once late September arrives. Surely by October it will be perfect. Shelbie, this sweater is sweet! I can hardly believe a person can actually knit something like that.. give me a sewing needle and thread any day. The cable stitch is beautiful. And you look very pretty in that shade of green. I love that green sweater. It won't be long until you will get to wear it. I'm in awe of you knitting talent. Beautiful sweater! I don't knit but I can appreciate great work! Your sweater is really pretty and I love the cable design. I don't knit but always wish I had learned (my MIL tried to teach me but I was just not good with the needles). 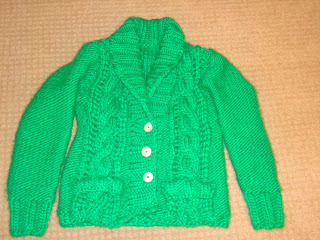 The sweater may be too warm for fall but it will look great at Christmas! your sweater is amazing Shelby! You are so talented! I love the color you chose too! Gorgeous! I'm so jealous but I don't have time to learn to knit. That green is divine! Wow - amazing! What a beautiful sweater. My daughter-in-law and myself took a knitting class and we both are having a hard time picking it up. I really admire your work! 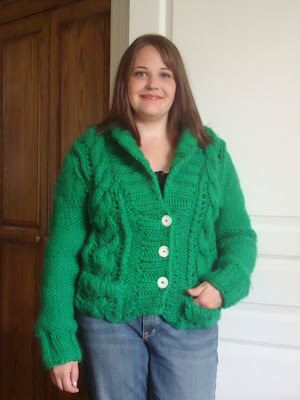 you are going to love that gorgeous sweater forever!!!! great job!!!!! Oh my goodness! This is very nice work. Good job. I love the color, too. It makes me happy. Way to Go Shelbie!!! Woooo HOOO! Very impressive indeed. i can has in pink?